The largest recognised chandelier in the world hangs inside the Sultan Qaboos Grand Mosque located in Oman weighing a phenomenal 8.5 tons. Although the Chandelier is the largest known the actual most is of modest proportions, for a grand mosque, having the capacity to house 20,000 worshipers who all can enjoy the marvelous splendor of this spectacular chandelier. The mosque has a very elaborate interior and also contains a library with tens of thousands of books. The chandelier, which hangs a total of 14 metres from the ornate ceiling, is beautifully trimmed with Swarovski crystals and has fine gold plated metalwork. The chandelier is truly of gigantic proportions having a diameter of 8 metres making it the size of a 3 bedroom detached house but twice the height! The inside of the chandelier has complex electrical circuitry which requires access for maintenance purposes which is made possible by staircases and platforms actually inside the heart of the chandelier. 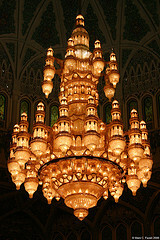 To emphasise the true beauty of this chandelier, for decoration it has 600000 crystal trimmings. For illumination the chandelier has 1122 halogen lamps which are operated through 36 switching circuits. With this number of bulbs then the energy consumption would be massive so dimmable technology has been incorporated for environmental purpose and to provide control over the illumination levels within the mosque. The chandelier is designed with a large central minaret and twenty four smaller minarets circled around it to produce its characteristic shape. There are thirty four other chandeliers of the same design but of smaller proportion hung at other locations within the mosque. 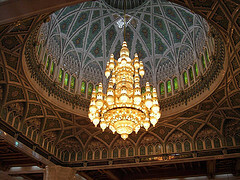 The mosque itself is 90 metres high so even a chandelier of these proportions does not look oversized within the space and with such a high ceiling a low hung chandelier is one of the only ways to light the space effectively and certainly with pleasing aesthetics to compliment the splendid interior. The Chandelier is not the only wonderful spectacle within the mosque as it also contains a handmade Persian prayer mat within the hall, which contains 1,700 million knots, covers 4200 square metres and weighs 21 tons. This prayer mat took 600 weavers four years to make. 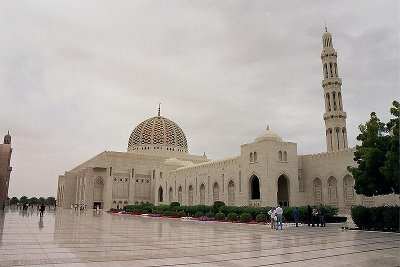 With these fabulous features and being described as the crowning glory of Oman, surely this mosque is well worth a visit!